Increase hiring accuracy using hiring data, advanced AI / analytics, and behavioral science. 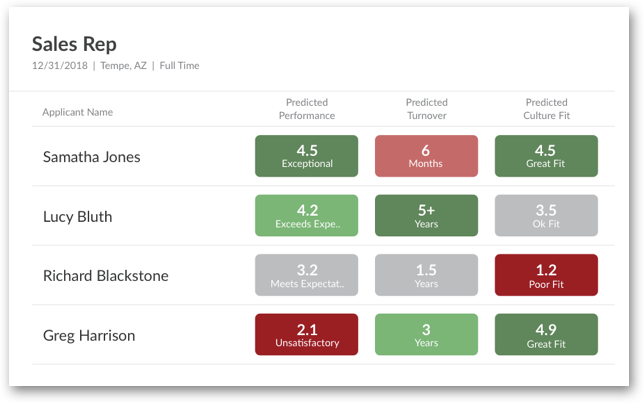 Journeyfront's predictive hiring software helps companies make hiring decisions with a level of accuracy previously unattainable. 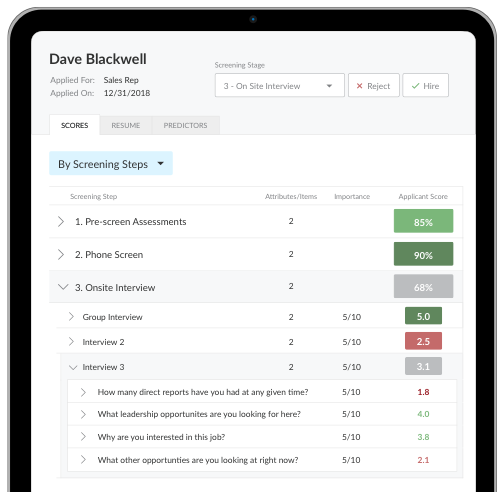 Screen candidates using advanced analytics built from patterns found between your employees' traits and the outcomes that matter to you (employee performance, turnover, satisfaction/engagement, culture fit, etc.). Meet the world's most powerful structured interview solution. Structured interviews are 5X more predictive then unstructured interviews. We've taken the power of structured interviews to exciting new heights. The Experts Agree. Data is Changing Hiring. Our #1 Prediction for 2019? Data-driven matching will become the new paradigm for hiring. "The highest impact action a recruiting function can take is to shift to a data-driven mode." "Winners in the war for talent will be those companies that harness data and advanced analytics." Whether you're looking to improve performance, reduce turnover, or optimize the cultural fit of your hires, Journeyfront was built to handle it all. Every company is different. Our insights are driven by your own data, capturing the unique nuances that matter at your company and in your positions. This means more accurate predictions that you can count on. All hiring data is automatically correlated with your post-hire outcomes. This allow companies to know what's working and not working in their hiring process at any given time so they can improve continuously. Set up for Predictive Interview takes < 1 hour. Set up for Predictive Screen takes 2-3 weeks.